My hair can be the bane of my life. I suffer from greasy roots and dry ends which mean I feel as though I have to wash my hair every other day and my life has been saved by my own discovery of Dry Shampoo. I also have thin hair but a lot of it and when I am stressed it leads to a flaky scalp and as yet I have not found a product that can cure all of this, I doubt I ever will, but I have found products that can deal with one part of it. I spend quite a lot on hair products and usually at my Salon’s request, stick with their offerings. Until now! I was recently sent a lovely gift package from the lovely people at Label.m and in that package was a shampoo and conditioner from their Age Defying Range. 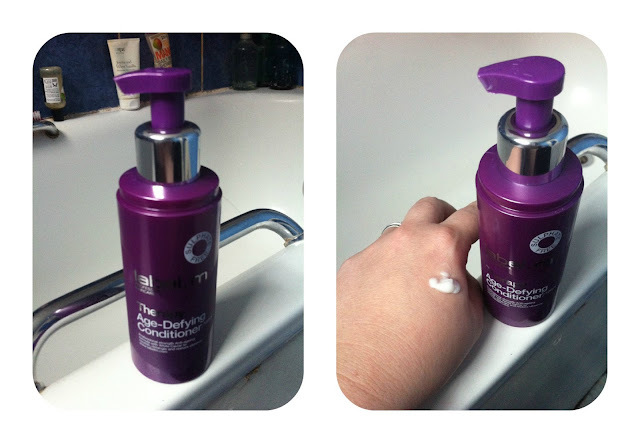 Both items are packaged inside lovely purple/plum coloured bottles and both feature a pump action dispenser, to dispense the shampoo and the conditioner. The bottles themselves are quite classy looking in design and wouldn’t look out of place in a top boutique hotel or hair salon, they are readily available online with the shampoo for a 200ml bottle is £13.95 and the conditioner is either £16.95 for a 150ml bottle. The label.m Therapy Age-Defying Shampoo has an ultra cleansing formula that is perfect to restore and replenish dull and weak hair and leave it feeling beautifully soft and full of life. The Label.m Therapy Age-Defying Shampoo comes from the gorgeous range formulated with 8 ultra caring and technologically advanced ingredients to reverse the visible signs of ageing so you can enjoy hair that is left looking and feeling strong, radiant and beautifully youthful. This sulphate-free shampoo will restore, replenish and rejuvenate. Designed to quickly transform weak, dull, aged hair into strong, radiant and youthful looking hair. The first thing I noticed when I came to use this shampoo was how easy it was so dispense, even with wet hands, two pumps of the dispenser and I had more than enough shampoo to cover my head of hair, The shampoo itself has an almost peal-esque colour to it which shimmers in the light, but what caught my attention the most was the sweet aroma that came alive. As soon as the shampoo is massaged into your hair and scalp, it lathers immediately where again the sweet smell that I instantly loved came alive. As you wash away the lather, ensuring you have nothing left behind, my hair was already feeling soft and smooth and I was yet to try the conditioner. The Label.m Therapy Age-Defying Conditioner is a gorgeous sulphate free conditioner that has been formulated to restore, replenish and transform weak, dull and aged hair leaving it strong, radiant and youthful. The Label.m Therapy Age-Defying Conditioner comes from the gorgeous range formulated with 8 ultra caring and technologically advanced ingredients to reverse the visible signs of ageing so you can enjoy hair that is left looking and feeling strong, radiant and beautifully youthful. I don’t use conditioner every time I shampoo my hair because I have found it makes my hair greasier much quicker, but whenever I do use a conditioner I do leave it on for a few minutes to give it time to work and I always brush it through using my Tangle Teezer. Then once I had washed the conditioner our of my hair, again the super soft feel was more evident than it was before, only this time the lovely sweet aroma more noticeable. Looking closer at both products Sugar Cane extract which is quite possibly where the sweet smell comes from and as you can see from the photographs, there are a huge amount of ingredients which will ensure both of these products are good for your hair and naturally they are sulphate free too. For me, my problem has always been one of three things. My hair is either greasier after using a product, my hair becomes too dry after using a product or my hair feels lank and lifeless. Having used these products for the last 5 weeks, my hair is none of those things, infact I am washing my hair every 3 days instead of every other day, my hair is soft and smooth with a natural shine and it is an absolute pleasure to style with my GHD’s, they glide through my hair. Quite a few people have commented on how lovely my hair smells, one lady sat next to me on a bus assumed it was my perfume, only to my told it was actually my shampoo and conditioner that left the sweet smell that she was referring too, thankfully she stopped short of actually smelling my hair in public, but the aroma does last for a good 24 hours before it begins to fade. The downside to these products? My husband likes them and I fear they will run out quicker than I hoped. 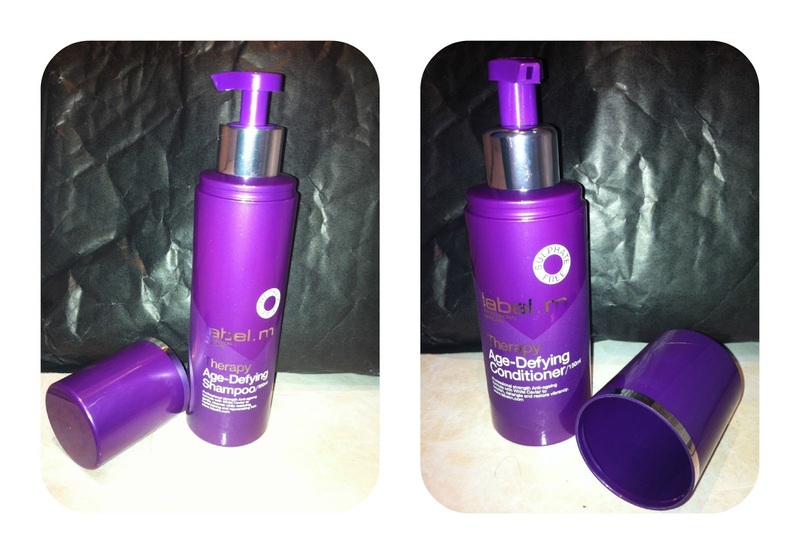 I have become a huge fan of Label.m products; I adore this shampoo and conditioner. Infact I love everything about it - the ease of use with the dispenser, the bottle design, the fragrance of both, how my hair feels after using and how my hair looks, it has a bit of life back into it. If you have never tried these products, I would urge you to do so! This is a fantastic review dear! I've heard great things about Label.m and I think it's time to try them! :)) Oh, and I love your downside; I laughed so hard!! Great review! It sounds really nice, I love pearly shampoos rather than clear ones as I find them better on my hair for some reason! Lol @ Hubby using it!